In 1990 Earl accompanied Gail (his wife to be) to an end-of-year get-together hosted by her department head at the high school where Gail taught. The hostess owned a pet quality Himalayan. Earl thought he had never seen a more beautiful cat and he spent more time that evening with the cat than the other guests at the party. The hostess told him about “cat shows” and eventually introduced him to the person who had bred the Himalayan and who also attended shows. Earl didn’t hesitate. He jumped in with both feet and became involved in the wonderful world of cats, CFA and the Midwest Region. By attending shows, Earl learned as much as he could about the Himalayan. He was then ready to purchase a show cat or two, but he found out not everyone was eager to place a show cat with a person with no show or grooming experience. Virginia King, Nancy Sullivan and Carl and Janice Shannon were brave enough to trust this new exhibitor with their cats and Earl was forever grateful to them all! In 1991 Earl purchased two females and a male from Virginia – Sealy, Pugs and Sissy. Sealy and Pugs produced Earl’s first litter – Thelma and Louise in 1992. Louise earned a Distinguished Merit title in 2001. Louise’s daughter DeWeaz DMed in 2002 and DeWeaz’s daughter DeSigned By DeWeaz DMed in 2004. In 2004-2005 he campaigned a DeSigned By DeWeaz son – GP, RW Le Club Fur DeSigner Genes – to Best Himalayan in Premiership. In 2005-2006 Earl also had two more regional winners, but his real love was the breeding more than showing. A chance meeting with Larry Adkison in the doorway of Petsmart led to Earl’s involvement in show production. Knowing Larry had a show-producing club, Earl asked Larry if the club could host a show. 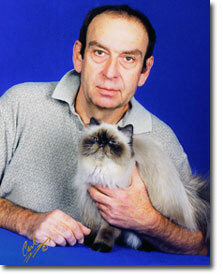 So Lakes Country Cat Fanciers began having annual shows in 1995. Earl served as show manager and also set up the shows. In 1998 Lakes Country hosted the Regional Awards show. Earl also became involved with Tiger’s Lair Feline Fanciers in Columbia, MO, where the club hosted two shows annually and Cat Springs Irregulars, which hosted a show in conjunction with the Kansas City Pet Expo. He served as an officer in all three clubs over the years. Earl worked tirelessly setting up and hosting shows in the Midwest Region. He believed strongly in promoting CFA, the Midwest Region and his beloved Himalayans. He was definitely a Spotlight in the Midwest Region!